AutoCAD is one of the most popular pieces of software used in the engineering and architecture sector, and more generally by people involved in design building, constructions, project management and other affiliated domains. The program was launched in the early 1980s and allows users to created 2-D and 3-D drafts and sketches, and in recent years it has become available in mobile and cloud-based versions as well. DWG (“Drawing”) and DXF (“Drawing Exchange Format”) are two of the extensions typically used with AutoCAD. 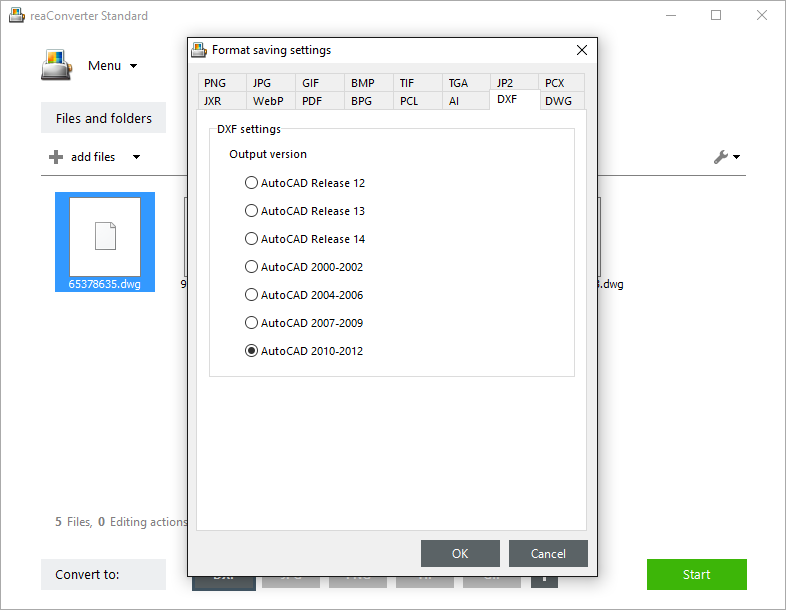 DWG can also be associated with other CAD (computer-aided design) programs too, including Caddie and IntelliCAD, while DXF was designed as a format that would increase interoperability between AutoCAD and other CAD programs. Since its initial release, AutoCAD launched a large number of updated versions. 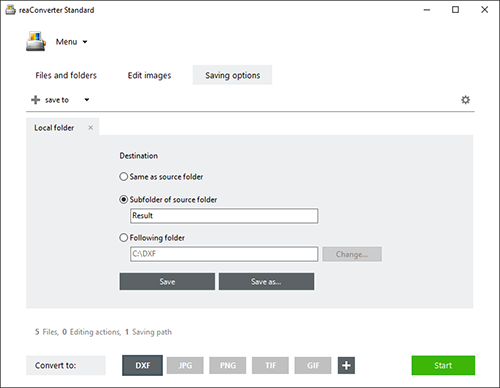 With reaConverter’s latest edition you can now choose between different versions when converting to DWG and DXF. Add one or more files you intend to convert to DWG or DXF. Pick them manually from your local hard drive or drag-and-drop them into the reaConverter window. Pick DWG or DXF from the buttons conveniently placed in the lower part of reaConverter’s window. In case you don’t see the 2 buttons there, click the Plus button and a new window will open, showing all supported output formats. Next, click on the Settings icon placed in the upper left corner of the preferred button. 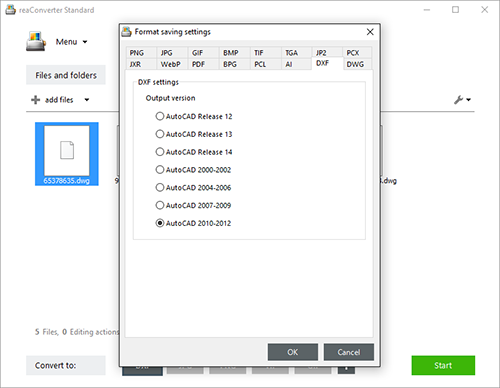 A new window will open, where you can pick the desired AutoCAD version for your output DWG or DXF files. 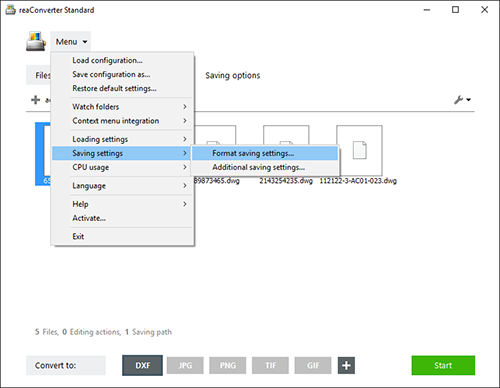 After opting for the preferred Autocad version, go directly to the Saving Options tab and pick where you want to save the output files. You can save them offline, in a local folder of your choice, or directly online, using one of the available cloud-based storage services. 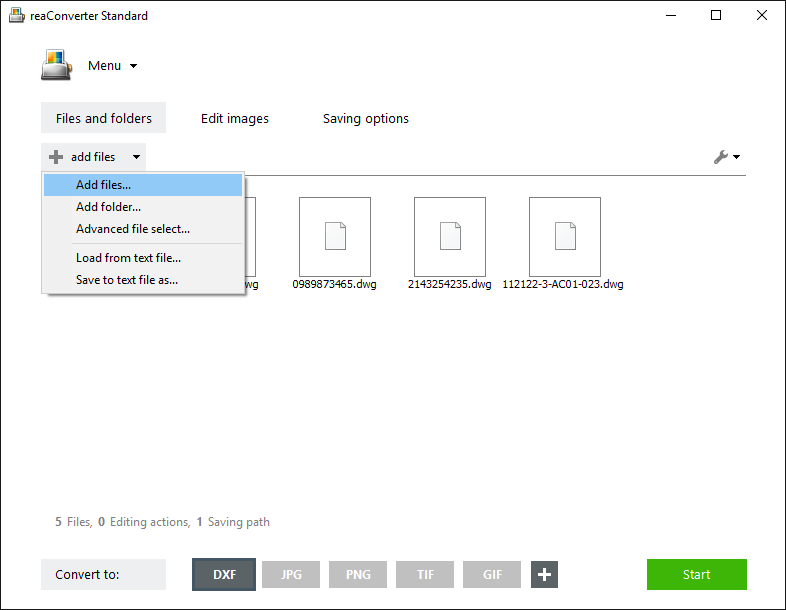 Then simply press Start, and your new DWG/DXF files will soon be ready!